You may want to evenly distribute the heat from your stove around the house or you may find that the room that the stove is too hot whilst the rest of the house is colder (or you spend money heating the rest of the house with gas or oil when you need not). Whatever the reason for wanting to distribute the heat from your stove there are a number of ways to do it, a few of which are discussed. Woodburning stove with a backboiler - central heating stove. The backboiler takes heat from the stove and warms the water in the backboiler. This hot water then heats radiators around your house (you can also run your domestic hot water from such a system). Some heating systems are referred to as 'gravity fed' or 'thermosyphon' systems whereby the tendency that hot water has to rise is used to make the water floe around the system. Some systems incorporate a pump to force the water around the system. A pump can be useful if the system is very large, but I have seen thermosyphon systems running very well in tall buildings. You can read more about using a stove to run central heating and read our Stoves with backboilers page. There are several ways of doing this but first you should think about how hot and cold air flow in your house. 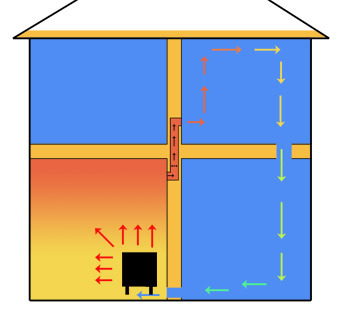 It is useful to think about airflow within your house. When moving the hot air from your stove around the house it is very important to install a return circuit so that air can flow back to the room which the stove is in. In this way you form an air circuit. If you do not then your will de-pressurise the room that the stove is in. 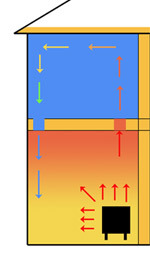 This can result in poor performance and smoking of the stove (and can be dangerous) and at the very least will result in excess cold air being pulled in from outside through your ventilation as well as meaning that the movement of air around the house that you are trying to achieve will not work very well. The air 'wants' to follow the way in which it normally flows. Hot air rises from the stove, meets the ceiling, moves away from the stove and cools. When it cools it starts to fall again until it meets the floor and it then moves towards the stove again. 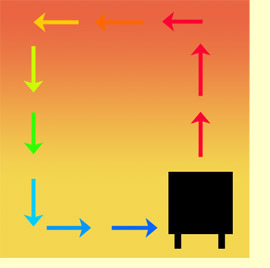 In this way the airflow forms a circle. Hot air distributed to other parts of the house move in a similar way and so you should place your vents, grilles, fans to work best with the way in which the air moves in the first place. Forced air flow through air ducts with in-line fans on an inset stove Inset stoves often have 2 - 4 hot air duct outlets on top of the stove. You attach class II liner as an air duct to these outlets and run the liner to other rooms. Often you run these air ducts up the chimney breast to the room above. 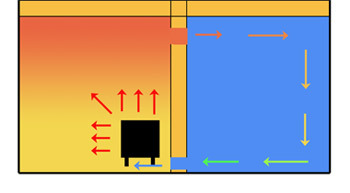 Hot air from the duct is delivered to the room through an air vent in the wall. As with all these ways of moving hot air around your house be aware that you will need to provide some way for air to return to the room that the stove is in. Because the hot air made by the stove rises you will find that the hottest part of the room is near the ceiling. It is possible to install air vents to the room above in the ceiling with a floor grille above. The air vent transfers the hot air in the room that the stove is in to the room above. This is a very simple and cheap way of moving heat around but make sure that the vents and grilles are large - small vents / grilles will make little difference. As always you need to ensure that air can return to the room with the stove in. Obviously the ducts / grilles will also transmit noise and smoke so you need to bear this in mind: if the room above is a bedroom then do not do it. If the room below fills with smoke you definitely do not want the bedroom to also fill with smoke. Please also bear in mind that ventilating in this way between rooms may not meet all relevant regulations. You can also use ducting with an in-line fan (commonly used in bathrooms extractors) to pump air from one room to another. Since the hot air from the wood stove rises you could also consider installing vents and/or fans above doorways to vent / pump hot air from the room with the stove in out to other rooms and hallways.